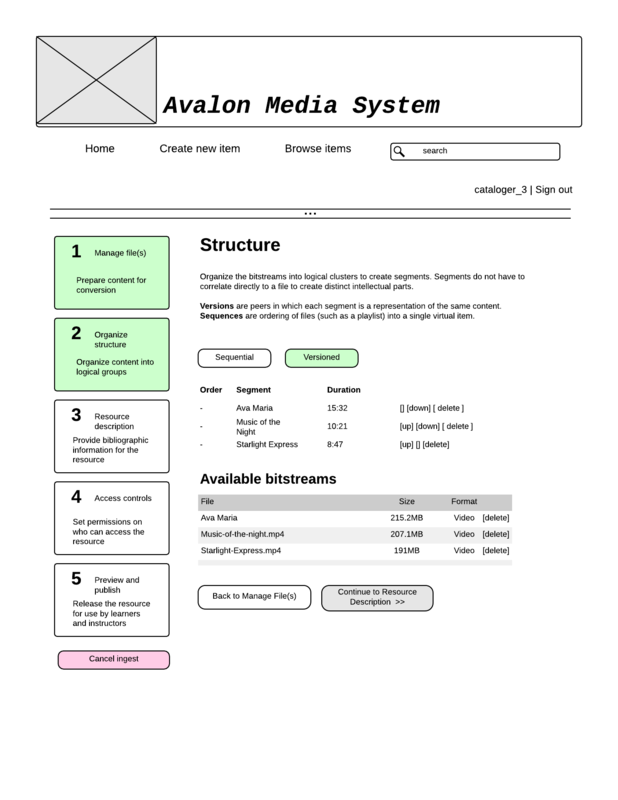 These wireframes are meant to explore possibilities relating to the creation, ingest, and location of resources within the Variations on Video platform. Examples include the workflow for a new video, importing content into an existing group, and the administrative aspects of managing a complex system. 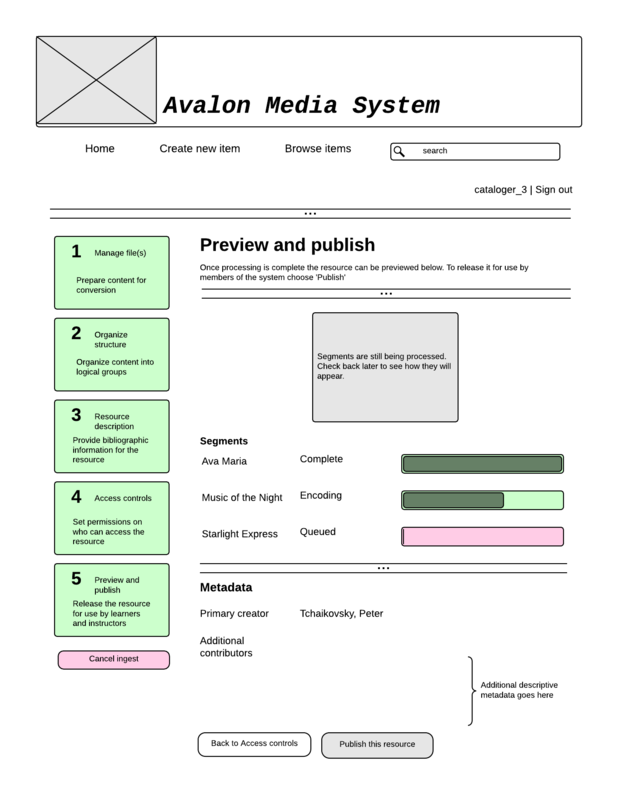 The general idea is that first users select a content type (audio or video). Next the files are uploaded to the system so that processing can take place in the background while the remaining steps are completed. 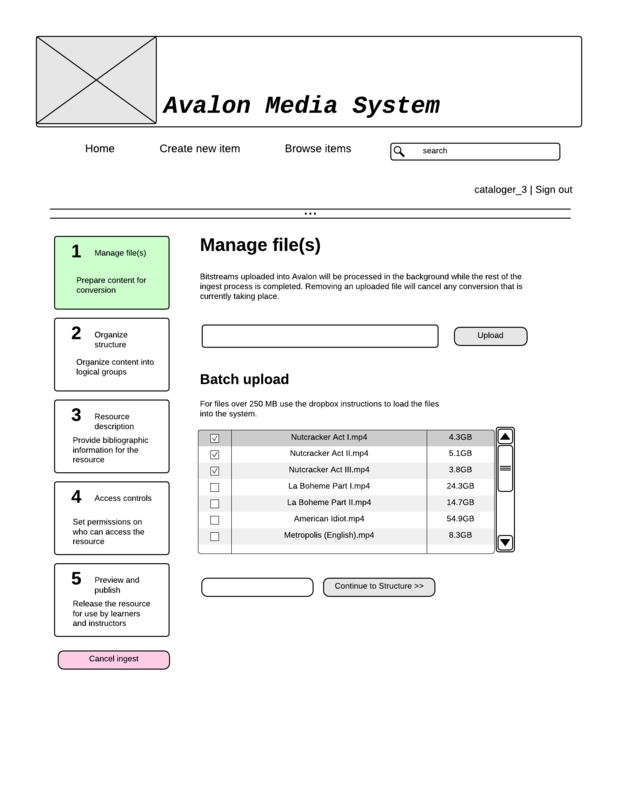 Next there is an agreement to acknowledge permission to add / upload the materials. Finally the last two screens provide an opportunity to describe the resource. The basic fields - title, creator, and description - are required for a minimal record. Additional information might include aspects of the metadata scheme in development. Metadata can be added manually or through a CSV or TXT document. In the latter case each field is validated before the user is redirected to the metadata form. Any errors are highlighted the same as if it had been manually entered using an incorrect format. 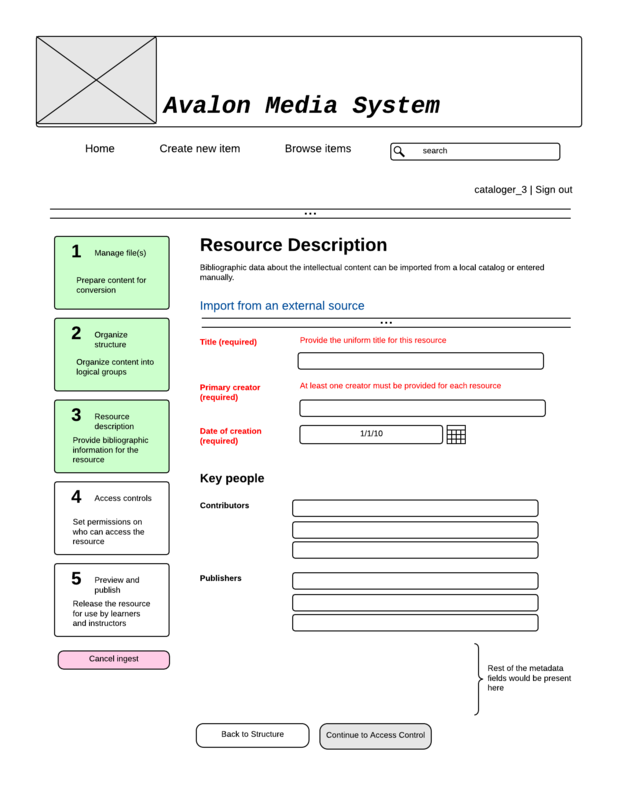 If no problems were found then the user is notified and presented with an already complete form to review. Metadata is committed to the system. At this point the metadata is available within the system. An updated video status should be provided with some sort of progress meter as well as a URL to revisit to check on status in the future. 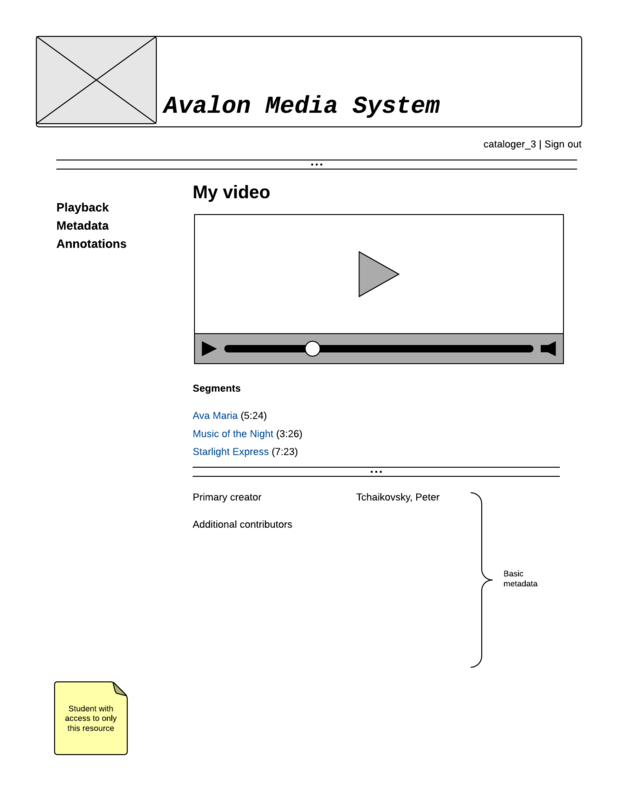 Optionally the user can receive an email when the video or audio has been ingested and is ready for review. 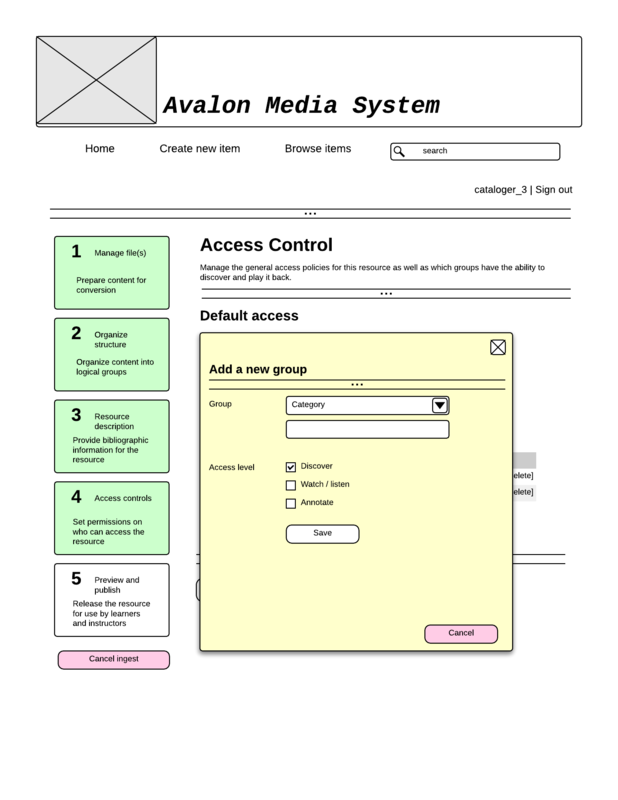 The interface allows for corrections at any time. Assuming that the user has edit permissions on the object they should be able to toggle between a mode that is playback with metadata display and making corrections which are committed in real time. This doesn't necessarily have to be the person who uploaded the video; it could be anyone in the system with curation rights. As realized in Release 1 the ingest process will make it possible for a digitizer to upload content into the system for conversion, provide manual descriptive metadata (either through the interface or a spreadsheet), and set access controls. Once it looks satisfactory the resource can be released. Unpublished resources will not show up in the search or browse results with the exception of people that have access to in-process resources. Not all features described here will be implemented by the December deadline. However, these additional features are intended to be phased in based on feedback from participants of pilots, user research, and experience with using the system as part of internal pilots at Northwestern and Indiana University.